When choosing a tarp, there are a lot of factors that need to be considered – durability, material, weather resistance, weight, etc. But one thing some people tend to overlook is size. After all, aren’t tarps generally big? Well, they are and they aren’t. Some are big enough while others are not. It all depends on where and how you’re going to be using it. Despite all protestations, tarp sizes always matter. A tarp of appropriate size will enable you to fulfill its purpose, whether it’s for creating shelter, covering equipment, making a shade canopy or serving as groundsheet. However, choosing the right size can be tricky. There are certain factors that you’ll need to consider. This brief guide should help you figure things out. 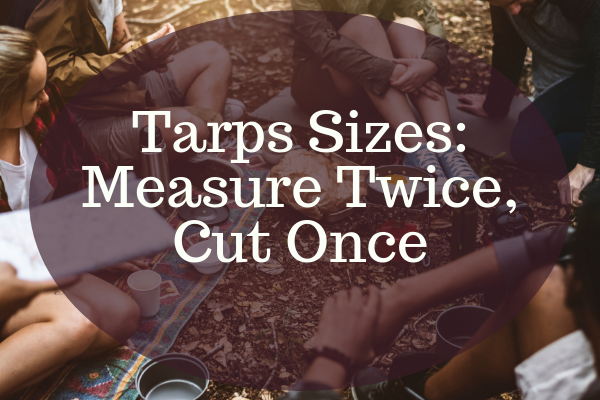 Before we get started on measuring tarps, we need to first discuss the cut size. This is the measurement of a tarp before it is seamed, hemmed, and eyeleted. The finished size of a tarp is therefore smaller, typically 30cm shorter or 4 to 6 inches smaller on each side. For example, a tarp that is measured as 10 feet would actually be around 9 feet 6 inches to 9 feet 8 inches. When choosing the tarp size, you need to keep in mind this shortfall. Tip #1: Consider the purpose. What are you going to use the tarp for? The size of the tarp will depend on what area you want to cover. Are you going to use the tarp as a groundsheet to help waterproof the floor of your tent? Then, you’re going to need to measure the floor dimensions of your tent and get the size that’s slightly larger than that. Do you plan on using the tarp for your hammock or as a form of shelter on your next backpacking trip? if you’re using the tarp for a hammock, your tarp needs to be at least 2 feet longer than your hammock’s length when it’s hung. If you’re going to use it as shelter, think of what configurations (i.e. A Frame, Adirondack, Basic Lean-to, Bivibag Cornet) you plan to use. Camping experts recommend a 9×9 square tarp which can be used to create a variety of shelters for one person. An 8×10 tarp would provide ample coverage for a single hammock. Other questions you might want to ask yourself include how many people will be taking shelter under the tarp and under what kind of weather conditions will you be using the tarp? During the summer, tarps that are small in size (8×8 feet and 8×10 feet) are considered better since it allows more ventilation, preventing people underneath the tarp from overheating. Large tarps (10×11 feet and 11x 11 feet) are better during winter months because they ensure that those underneath are not exposed to the elements as much as possible. Also, are you planning to use the tarp for more than one purpose? If so, you’ll need to ensure that your tarp is large enough to suit all your “covering” needs. If you’re going to be covering a three dimensional object, you need to measure the length and width of the top of the object then add enough meters to both dimensions to cover the sides of the object. For example, you want to cover a haystack. Measure the top of the haystack and calculate how much of the sides you want covered. If you want the tarp to cover up to 1 meter on each side, then add 2 meters to the length and the width. If you’re going to use the tarp to cover your roof, then you also need to consider the pitch of your roof or the way the roof rises from the bottom edge to the top. This is because the pitch of a roof actually increases a roof’s total measurement. For example, roofs have a typical pitch of 27 degrees which adds 1.2 meters to a roof that measures over 10m. So if one side of your roof measures 10m, you’re going to need a tarp with an overall length of 11.2m to cover that side of your roof. Aside from that, you also need to add another 8 feet to the length of the tarp and an extra 6 feet on the width. This gives you an extra 3-4 feet on each side that will be used to tie up the tarp around planks before attaching it to the roof. Tip #2: Consider the weight. When choosing the size of a tarp, you also need to consider weight. Typically, the bigger the tarp is, the heavier it will be. Now, this won’t normally make a difference if you’re just going to use it to cover a piece of equipment or a hole in your roof. However, if you plan on using the tarp on your next hiking trip or even a day at the beach, you’ll also need to consider how difficult it would be to carry. Tip #3: Consider maintenance and storage. You won’t be using your tarp all the time which means that you’ll probably need to store it away somewhere when not in use. Small tarps are easy enough to fold flat or into a bundle. They won’t make a dent in your cabinet space or shelf space in the garage. Large tarps, however, can be quite difficult. First of all, tarps should be cleaned and dried before storing to ensure they remain intact, even in long term storage. Cleaning a very large tarp can be difficult. Ensuring all parts of it are dry means laying it down flat on your garage floor or driveway and wiping it all down. Afterwards, you’re going to need to store it in a dry place that’s away from sunlight.